FROM ‘inter-barangay’ to the Philippine Basketball Association (PBA). That's what Rodney Brondial is out to accomplish as the former Adamson stalwart is one of the 95 players who made themselves available for the PBA Annual Rookie Draft on August 24 at the Robinsons Place in Manila. Before becoming a key player of the Falcons during the coaching tenure of Leo Austria, Brondial was just another basketball-loving kid who did the rounds of barangay leagues during summer. It was during one such appearance in a league at Philam Homes in West Avenue, Quezon City where Austria, who happened to be in the neighborhood visiting a relative, spotted Brondial playing in a championship game. Brondial went on to have a long career with the Falcons and shone as one of the most versatile players in the UAAP, becoming part of a couple of Adamson teams that reached as far as the Final Four. Now 23 years old, the 6-foot-5 Brondial hopes to fulfill his dream of playing in Asia’s first-ever play-for-pay league. So sure is Brondial about his plan that Brondial submitted his application papers just two weeks after the league opened the door for rookies seeking to join the draft. Brondial said he has no problem playing for any team in the pro league although it would be better if he’ll play once more for Austria, who is now the head coach of San Miguel Beer. “Kahit saan naman po basta makalaro sa PBA. Pero siyempre, kung bibigyan ng chance, iba pa rin kapag si coach Leo,” said Brondial, who last played for Big Chill in the PBA D-League. 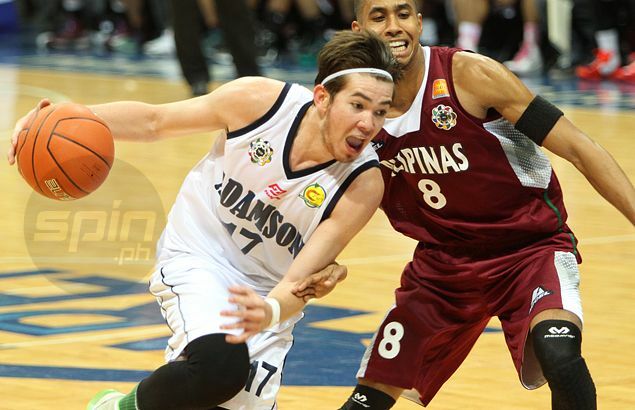 During his playing days at Adamson, Brondial said Austria wanted him to play like his idol, San Mig Coffee and Gilas Pilipinas standout Marc Pingris who also toiled for a long time in smaller leagues before rising to fame in the MBA and PBA. Brondial said he is preparing himself mentally and physically for the tough grind ahead in the pros as he even played against ex-PBA players recently in Brunei. “Doon lang po lagi nag-wo-workout at skills training sa Headstart Sports Academy. Doon nagpa-pakundisyon. Nagpunta rin po ako sa Brunei, may mga nakalaro din po akong mga ex-pro. Dagdag experience din po,” said Brondial. Unlike last year’s rookie batch, this year’s draft doesn’t feature a lot of quality big men and Brondial hopes to take advantage. “Puwede ko rin pong maging edge ‘yun,” he said.